Looking for the right company to install fences in Miami? That is what we are all about! Gomez and Son Fence is a fully licensed fence company serving Miami and its surrounding areas. Gomez and Son Fence is the Miami fence company you cant count on for all of your custom fence fabrications and commercial fence installations. We have our own in-house professional installers with over thirty years of experience in the industry. Our technicians have the equipment and tools to handle installation, repair, and customization for any size project, no matter the design or layout. 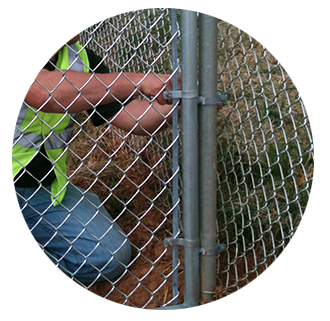 We provide services for various fences, barriers, and gates including chain link, wood, aluminum, iron and monitored gates. CUSTOM FABRICATIONS As a full-service fabrication shop, we have the experience and equipment to design and fabricate custom fences in Miami. TEMPORARY FENCING The perfect solutions for jobs and events that are constantly changing locations. Temporary Fences are easy to put up and take down. CHAIN LINK FENCING Chain link fence is one of the most popular selling fence product as it is the most cost-effective and easy to install fencing systems. Gomez and Son Fence is committed to providing top quality fence materials, installation and customer service. Our Clients needs are our number one priority that is why we guarantee no project is done until you are 100% satisfied. We also provide a 24-hour emergency on-call service to ensure your fence is properly maintained over time. That has kept us the leaders in the business for over 30 years. Contact us online for a free same day estimates or call us today at 305-471-8922 to speak to one of our representative about your next project. Our staff is always standing by ready to assist you with any questions you may have. Continue browsing through our website: Gomez and Son Fence to learn more about us and find out why we are the most reliable fence company in Miami. We look forward to working with you.